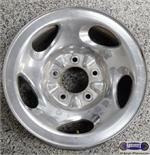 3194b, Used Rims, 16X7, 5 LUG, 135MM, 97-00 FORD, F150, POLISHED ALUMINUM 5 LARGE OVALS [TEAR DROP], 5 POLISHED SPOKE. 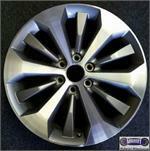 3205a, Used Rims, 16X7, 5 LUG, 135 MM, 97-00, FORD, LINCOLN, EXPEDITION, F150, F-150, PICKUP, NAVIGATOR, 9 HOLE, BLACK STEEL. 12mm BOLTS 14mm BOLT HOLE, MAY BE STAMPED 14mm INSET. A=BLACK B=ARGENT. 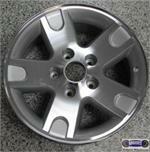 3279, Used Rims, 16X7, 5 LUG, 135mm, 98-99, LINCOLN, NAVIGATOR, MACHINED FACE PAINTED SPARKLE SILVER POCKETS, 10 SLOT, ALLOY. 3331, Used Rims, 17X7-1/2, 5 LUG, 135mm, 99-00, LINCOLN, NAVIGATOR, 12mm WHEEL BOLT, 14mm BOLT HOLE, CHROME, 5 SPOKE, 4 NOTCHES IN EACH POCKET, CHROME STEEL. 3557, USED RIM, 17X7-1/2, 6 LUG, 135MM, 04-08, FORD, F150, PAINTED GRAY, 5 WIDE SPOKES, STYLED STEEL. 3559b, Used Rims, 18X7-1/2, 6 LUG, 135MM, 05-08, FORD, F-150, PICKUP, ARIZONA BEIGE POCKETS, MACHINED ALUM, 5 SPLIT SPOKES, ALLOY. 3559d, Used Rims, 18X7-1/2, 6 LUG, 135MM, 05-08, FORD, F-150, PICKUP, CHROME CLAD, 5 SPLIT SPOKES, ALLOY. 3646, Used Rims, [New Replica] 20X8-1/2, 6 LUG, 135mm, 06-08, FORD, F150, 6 RAISED SPOKES, MACHINED, PAINTED SILVER POCKETS, ALLOY. 3784a, USED RIM, 18X7-1/2, 6 LUG, 135MM, 09-12, FORD, F150, KING RANCH, ALUM, 7 SPLIT SPOKE, & GOLD PAINTED INSERTS. 3786, USED RIM, 20X8-1/2, 6 LUG, 135MM, 09-12, FORD, F150, CHROME CLAD, 6 SPOKE. 3788, Used Rims, 20X8-1/2, 6 LUG, 135mm, 09-11, FORD, EXPEDITION, F150, F-150, 8 SPLIT SPOKE, POLISHED FINISH, ALLOY. 379, Hubcap, 15", 74-78, CHRYSLER, (RWD), NEW YORKER, NEWPORT, DEEP DISH TYPE, POLISHED CAP, RIBBED, WORDS CHRYSLER, METAL CLIPS.